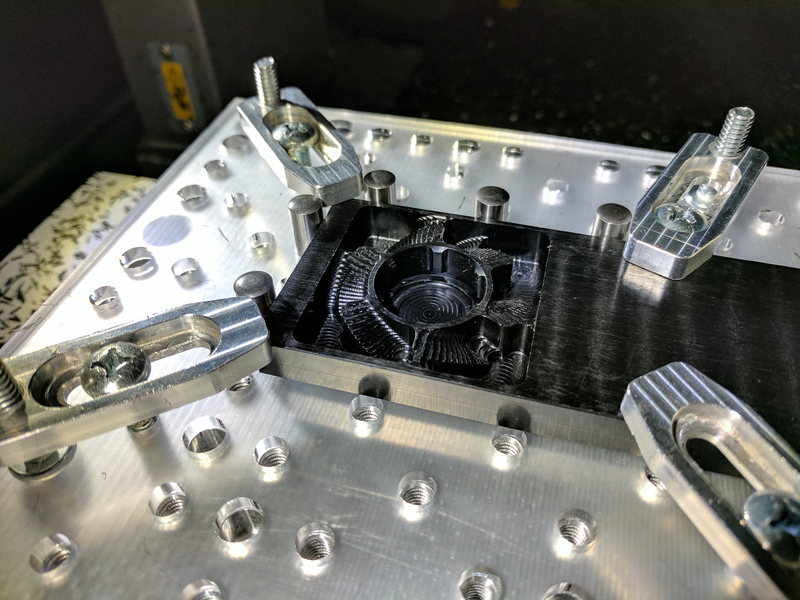 Milling accuracy is paramount for this design: the tolerances must be low enough to keep the spindle from becoming unbalanced. 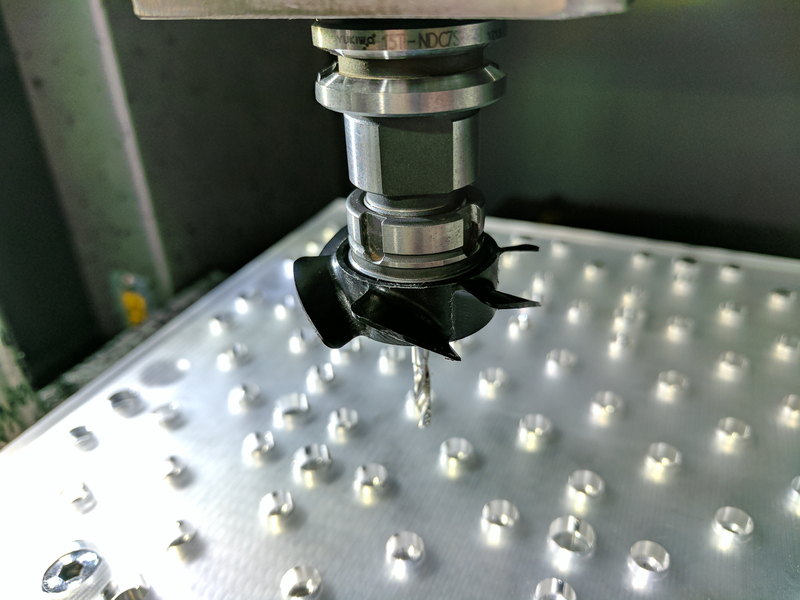 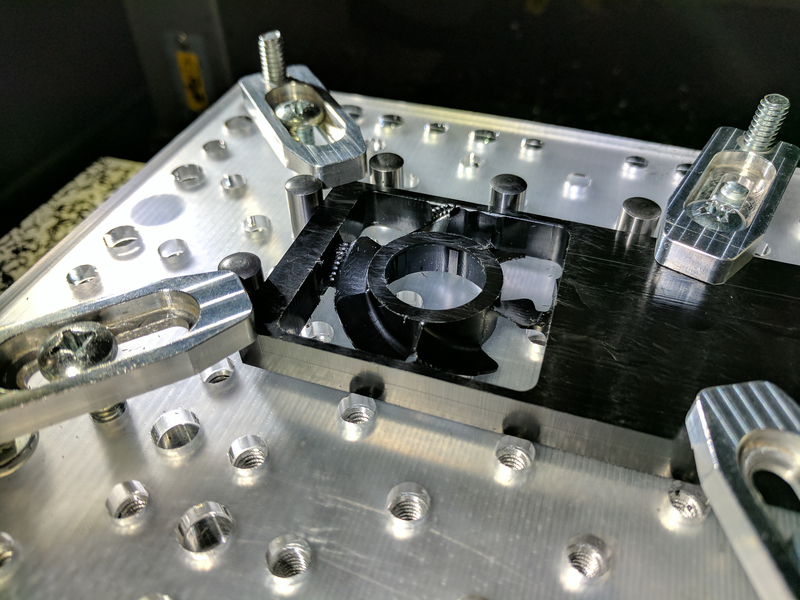 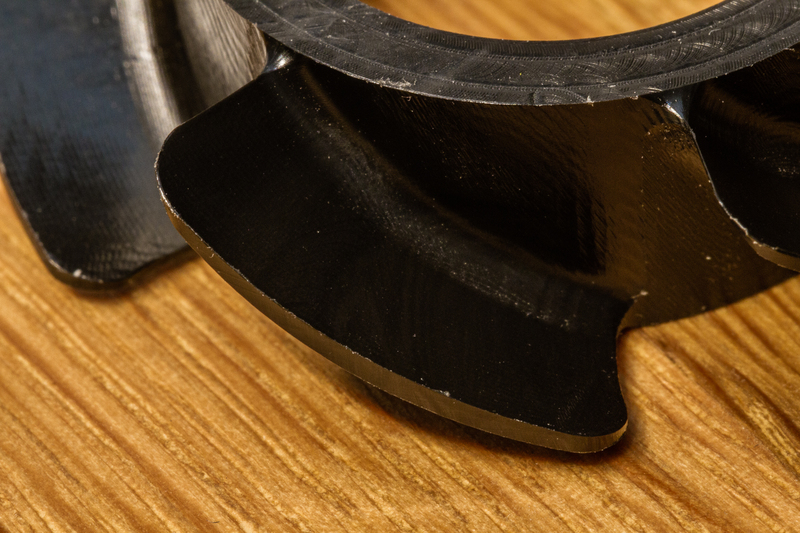 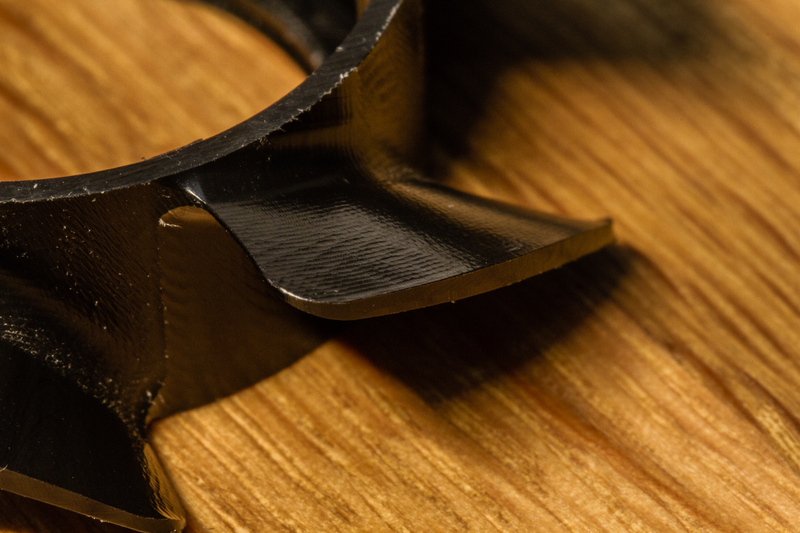 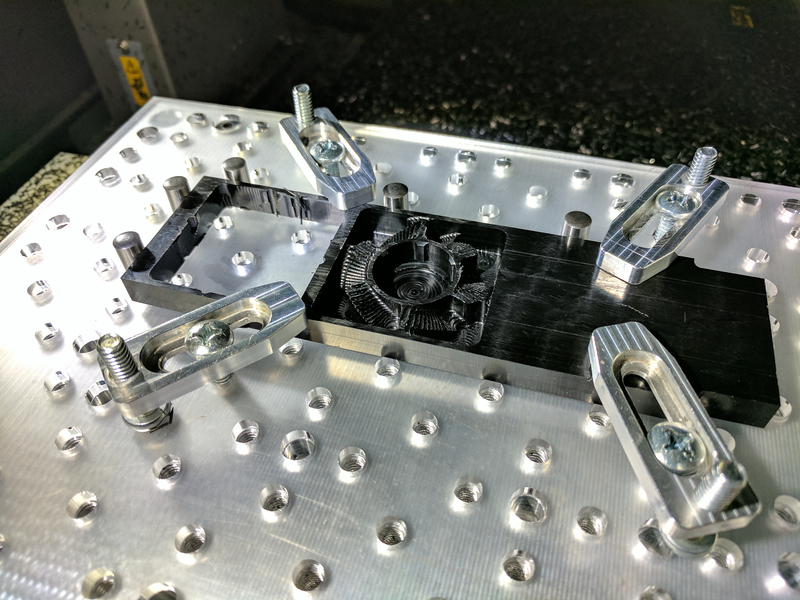 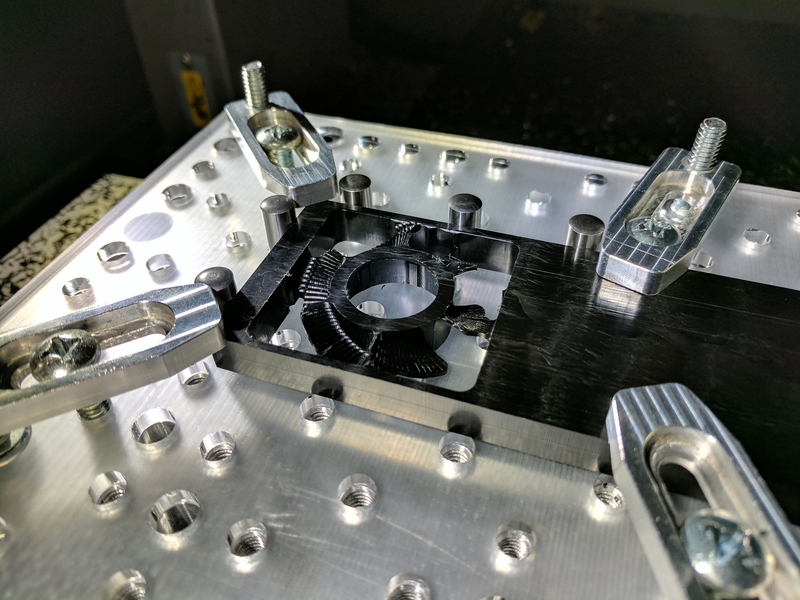 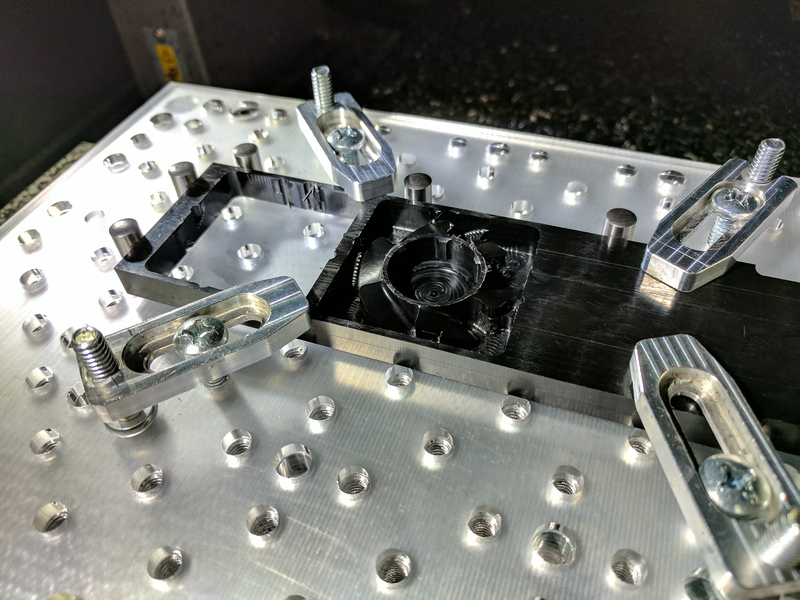 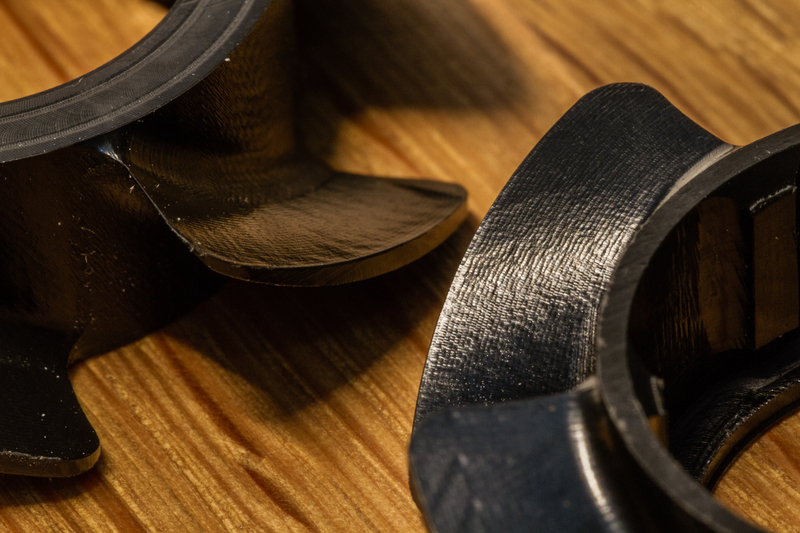 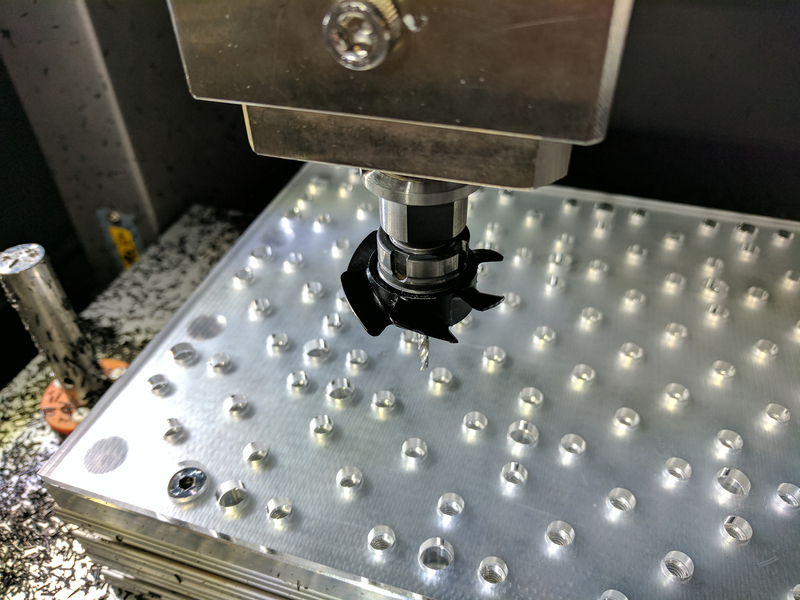 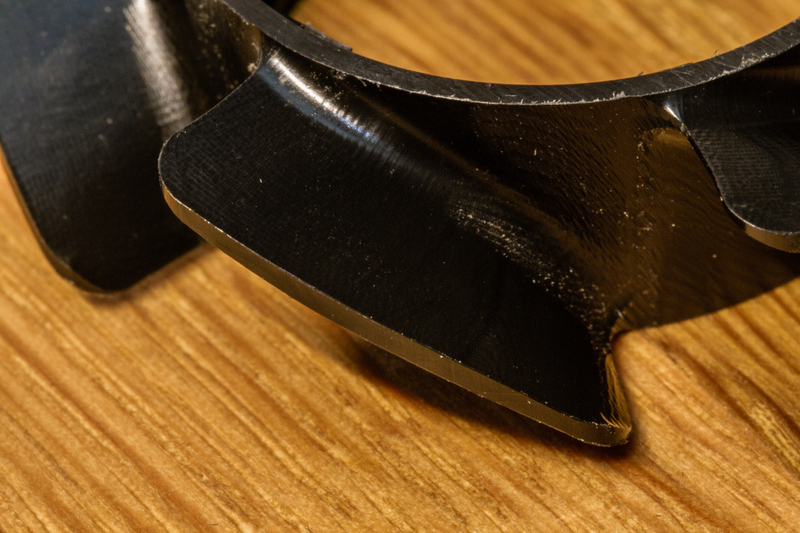 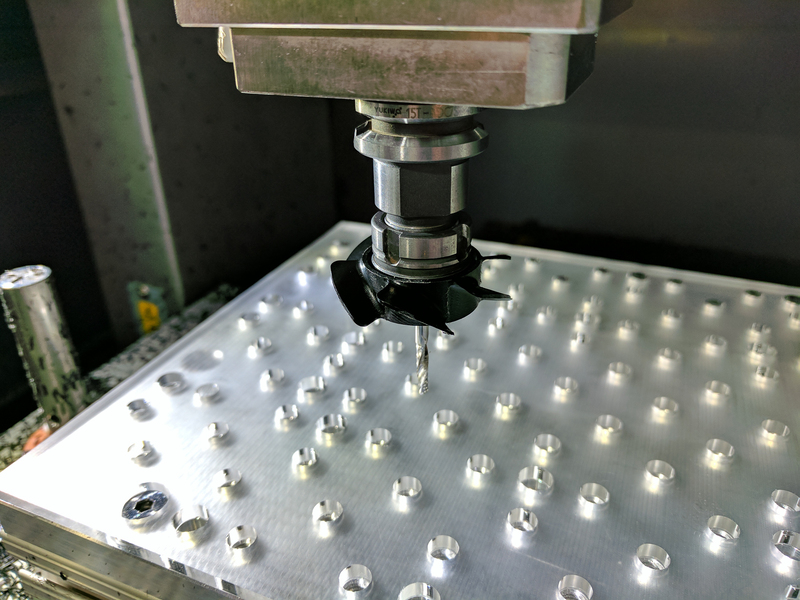 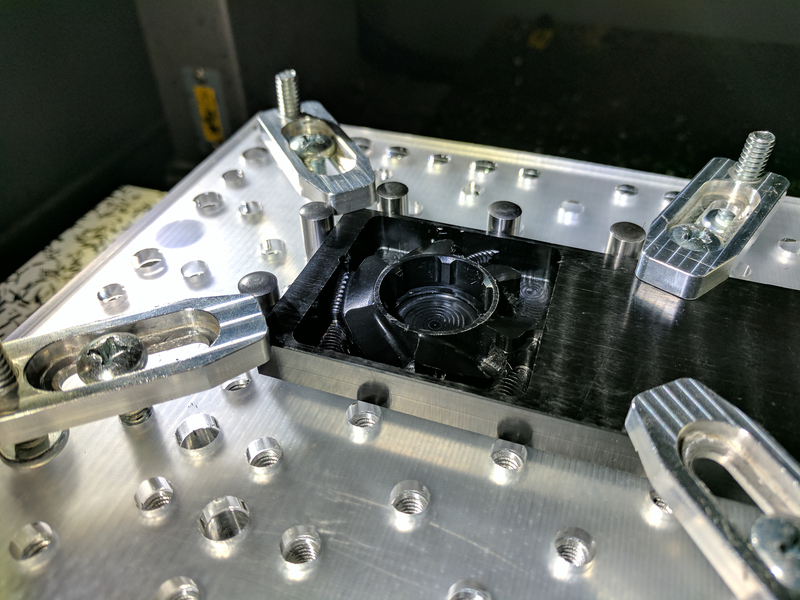 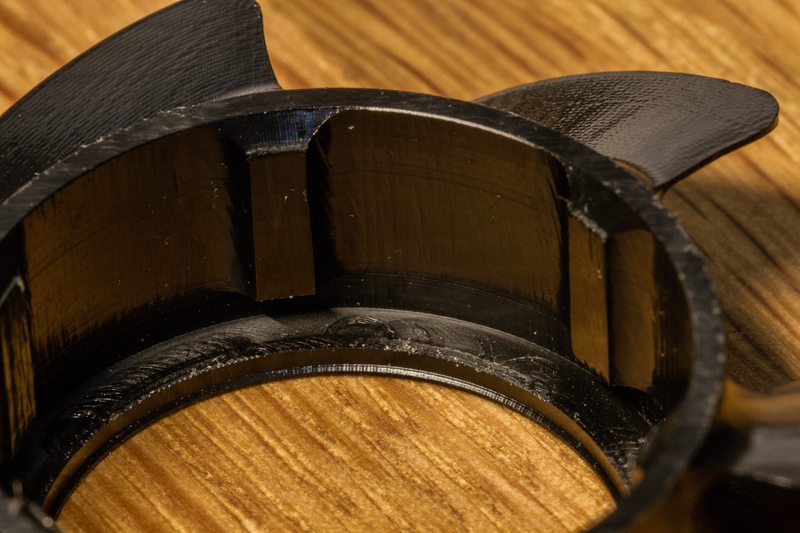 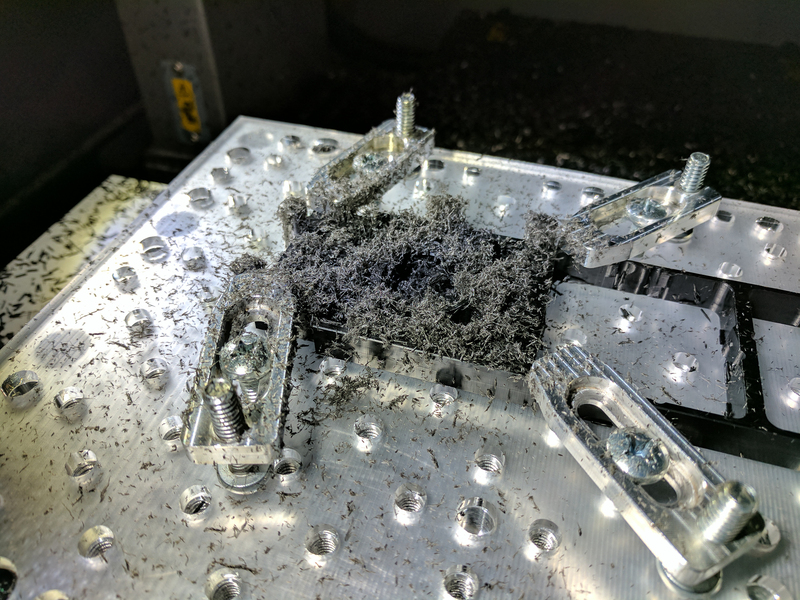 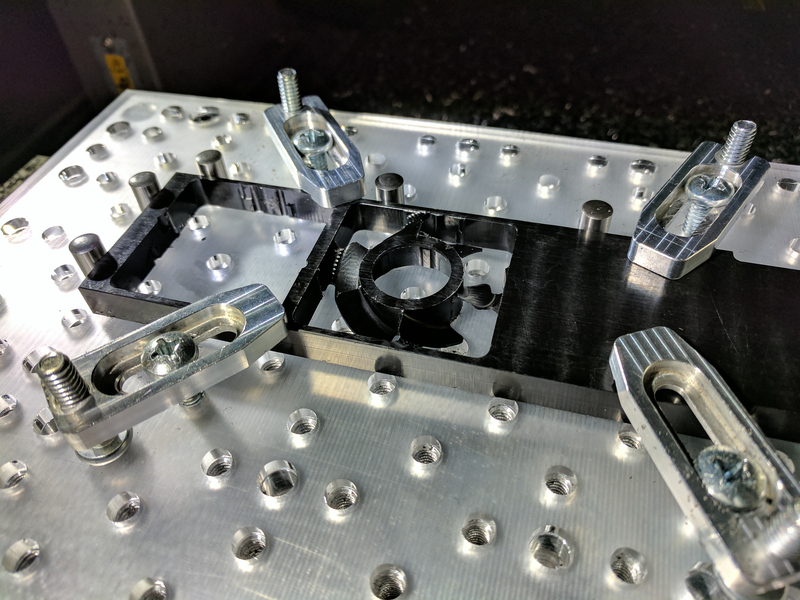 Since this design requires milling from both sides of the stock, achieving such accuracy is normally impossible without the use of a vise paired with an edge finder. 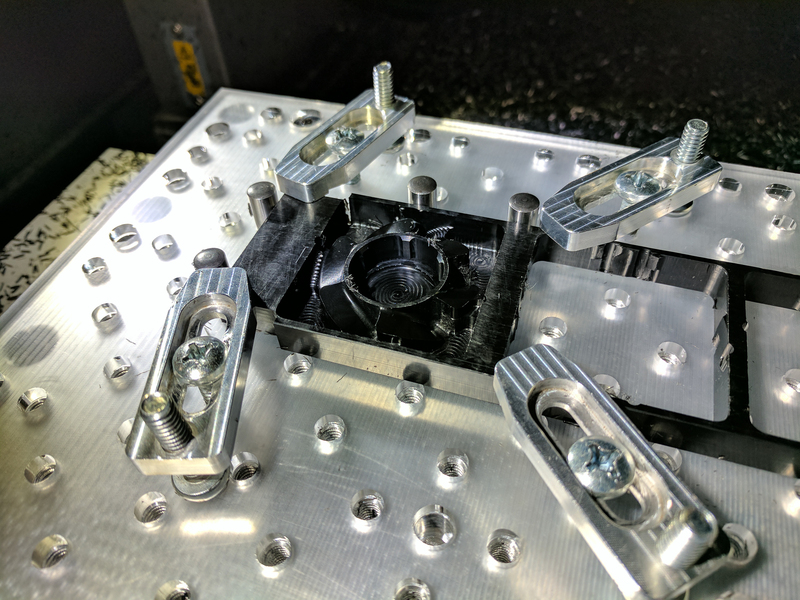 The Roland has neither unfortunately since there is very little space to mount a vise and 1/4″ edge finders don’t seem to exist. 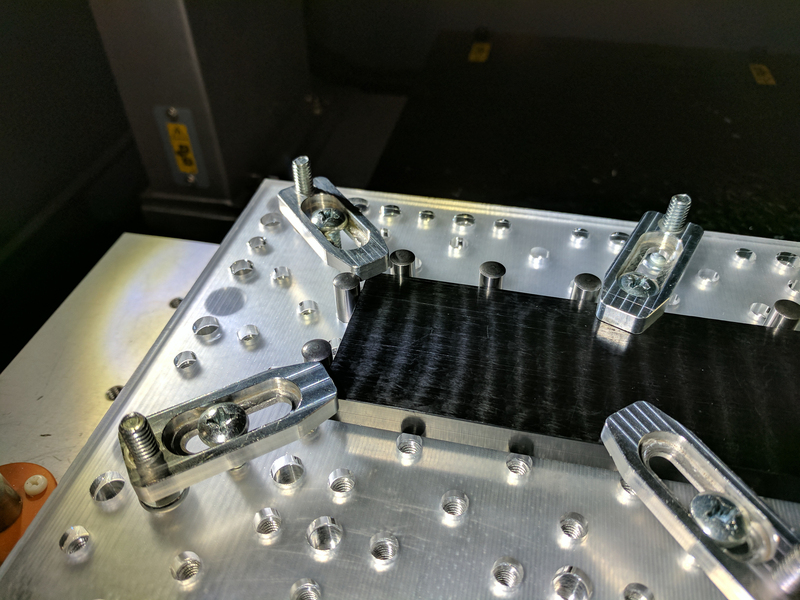 Using the fixturing table I made however, I was able to use the alignment pins to mount the stock such that the coordinates of a given corner (bottom upper left) is known both before and after flipping the stock. 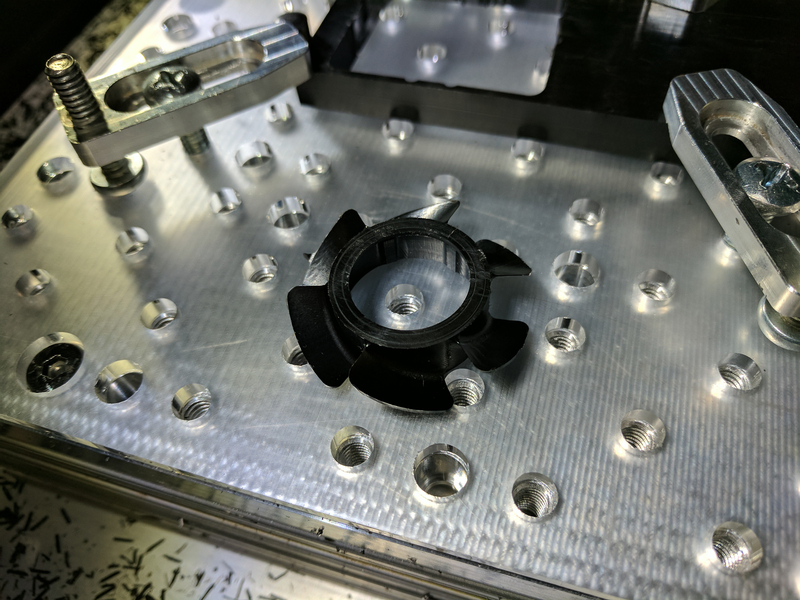 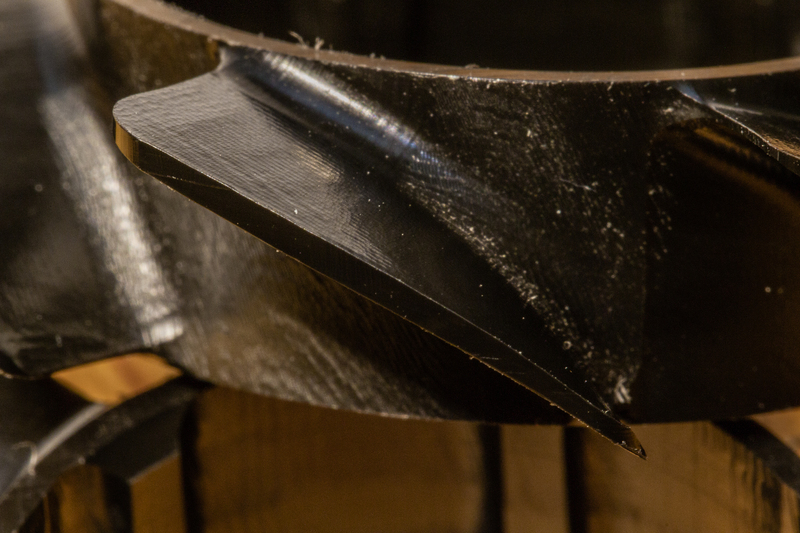 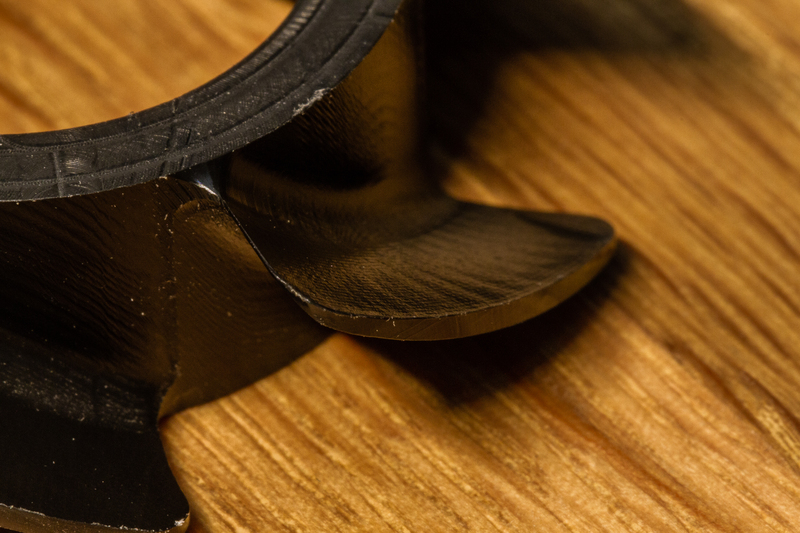 Measuring the thickness of the fins near the middle resulted in a variance of around 0.001″ across all three fans, well within acceptable tolerances. 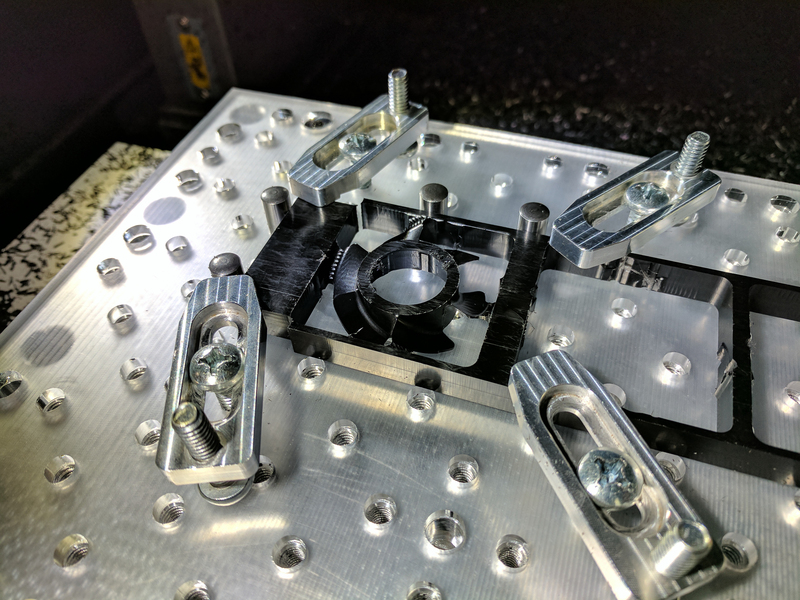 Tweaking the stock positioning to achieve this was difficult as there are a number of factors, from squareness of the stock to the amount of force used to press the stock against the alignment pins, any of which can easily throw the alignment off by a significant amount. 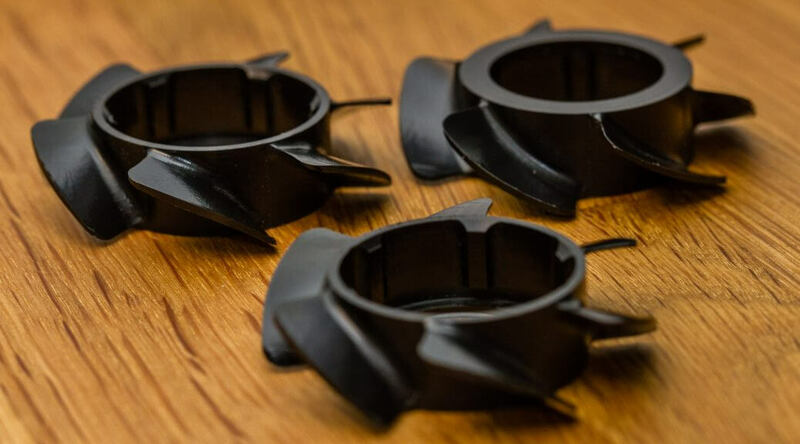 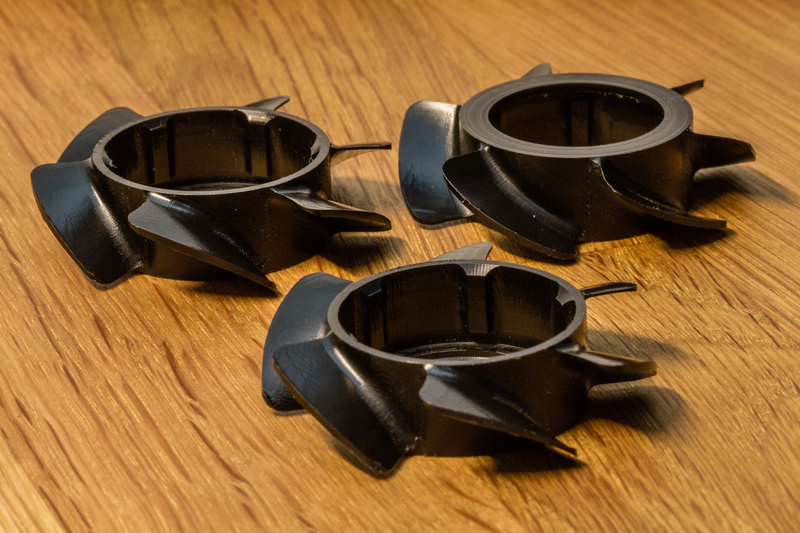 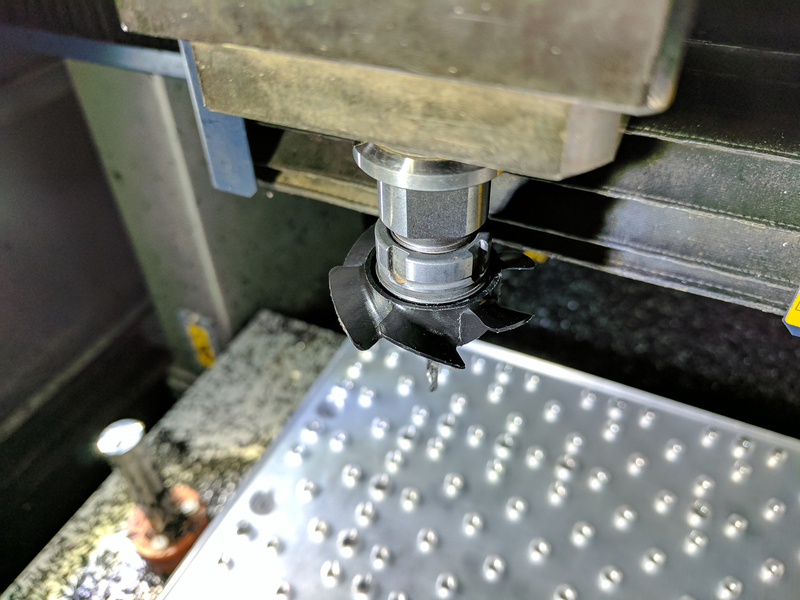 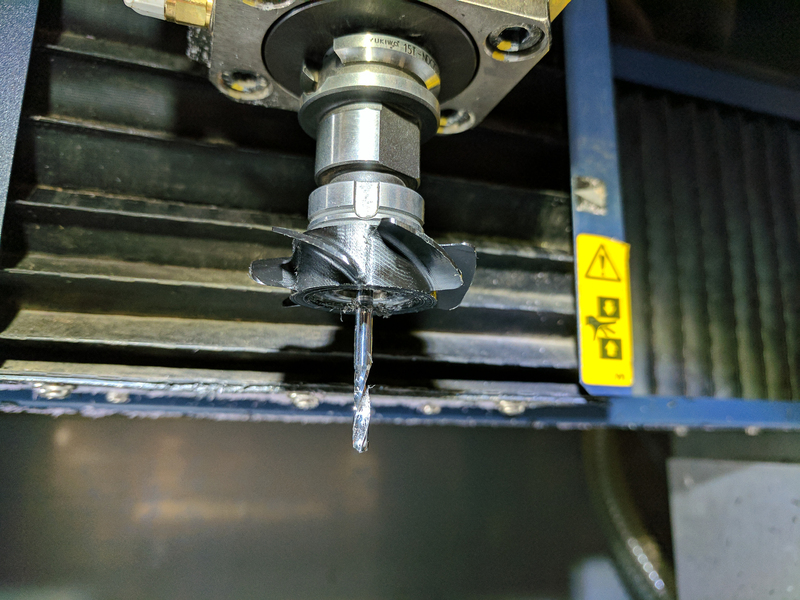 The fans themselves are machined out of delrin, a strong but fairly expensive plastic that is excellent at holding dimensions and can be milled with ease.